At a pivotal moment in the opening act of Richard Greenberg’s Three Days of Rain, Walker Janeway pounces on a sentence in his dead father’s journal that only becomes visible in a certain slant of light – a stain that turns out to be words. Written by celebrated architect Ned Janeway shortly after the untimely death of his business partner, Theo Wexler, the phrase leads Walker to believe he has found the answer to why his father’s will divided his estate so shockingly. There’s a bit of a cosmic joke that Walker is playing on himself here, but we don’t get to see it until deep into Act 2, which takes us back 35 years to 1960. In the same loft where Walker pored over Dad’s journal, we encounter Ned, Theo, and Lina, the woman who is torn between them. These are the parents of the people we’ve met at the start – Walker, his best friend Pip, and his sister Nan. And they’re the same actors, so you’ll catch the resemblance. What Walker gets wrong is the true object of that wee stain of a sentence. He presumes it refers to all the world-famous buildings and homes conceived by the Wexler-Janeway architectural firm with their genius designs. Turns out that Lina, Nan, and Walker himself were more likely at the heart of what Ned was getting at. “Everything,” you see, can mean a lot of different things. Probably because all eyes were on Julia Roberts when Three Days of Rain made its Broadway debut in 2006 (nine years after its original run at Manhattan Theatre Club), more than a couple of critics were as off-target as Walker in their suppositions when they sleuthed out the point of it all. Restoring the original balance of the script, which centers its concern on the relationship between Walker and Ned, the current Charlotte’s Off-Broadway production at Spirit Square enables us to see more clearly. Sure, it might be tempting conclude that Three Days of Rain demonstrates how narrowly children know their parents, flipping the plot of King Lear. Yet this production at Duke Energy Theater, so meticulously directed by Paige Johnston Thomas, reveals all of the pains Greenberg went to in making sure that Walker and Nan are exceptionally ignorant of their parents’ relationship and inner lives. So is Pip, vis-à-vis his dad. We hear early on from Walker that his dad was nearly mute throughout his childhood, though we don’t learn why until we meet Ned after intermission. As for Lina, she has been strung out on drugs and/or insane since Walker was eight years old. Perhaps Walker could have gained some additional insights if he had attended Dad’s big A-list funeral and listened to the eulogies, but he skipped that, preferring to brood artistically in Italy for a year. Add to those deprivations the usual distance between fabulously wealthy parents and their kids – both of whom are free to globetrot when the impulse hits – and you can see why the journal that Walker discovers at the fateful loft is like a precious canteen filled with water that surfaces in the vast Sahara. Ryan Maloney’s set design has a loosely precise look, like a blueprint drawn free-hand. Even in its abstractness, the design doesn’t destroy the workshop vibe of the loft. From the moment he appears on these hand-drawn quadrangles, Brian Lafontaine delivers a beautifully calibrated performance as Walker. You might look back, when it becomes obvious that he’s a snooty, shiftless, and irresponsible underachiever – with sprinklings of self-pity and hypochondria– and think that Lafontaine was a little too genial and yielding at the start. Yet he’s not only speaking to us for the first time, he’s also meeting up with Nan for the first time since he disappeared without telling anyone where he was going. During his yearlong absence, Nan had come to terms with the probability, after hired detectives came up empty, that her brother was dead. So a bit a caution and contrition must be stirred into Walker’s Bohemian mix. Especially since he has forgotten that he was supposed to rendezvous with Nan at the airport. Ooops. The meanness and arrogance of the man, peppered with resentment and delivered with some nasty sarcasm, come out after the disposition of the estate, when Walker comes back to the loft. Now the brunt of his attention is directed at Pip, who has drawn the one property that Walker cherished most. Pip actually offers a more plausible reason why this has happened: he had actually established a normal speaking relationship with Ned. But watch the seething, stony way that Lafontaine absorbs this and other revelations from his friend. He’s not much of a listener. As for Lafontaine’s work on Ned, it may stand as the best he has given us in over 25 years on Charlotte stages, surprisingly effortless and touching at the end. Who saw this all winding up like a bittersweet romantic comedy after the fire that brought us to intermission? Restoring Lina to lifesize, Caroline Bower is a huge reason why the Act 2 denouement is so poignant and satisfying. In the opening act as Nan, Bower is far more subtly nuanced, demonstrating how the role can bloom with a real stage actress. Nan is the offended normal sib who has the right to be absolutely disgusted with her brother’s inconsiderate flights, but if you closely watch her reaction to his blather, you’ll see that she momentarily drops her front of stern reproach, charmed and loving in spite of herself. There’s a parallel ambivalence in her attitude toward Pip, hints thrown our way when he appears in the second scene, fireworks ready to explode when the reason is disclosed in the Act 1 climax. 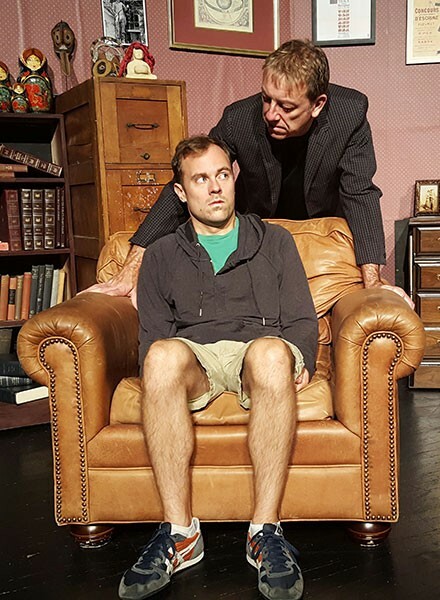 If Lafontaine and Bower embody one of the chief satisfactions of a vibrant local theatre scene, watching familiar professional performers radically transforming themselves into new roles, Chris Speed personifies the excitement a newcomer brings. After his richly textured accounts of both Pip and Theo, I can hardly wait to see what he does next. Pip realizes that, making his living as a soap opera stud, he is little more than a thin shadow of what his great father was. But he’s cool with that, though he seethes at Walker’s perpetual hypochondria and condescension, helping to bring the 1995 action so nicely to a boil. Less open to the charge of superficiality – because he has loftier ambitions – Theo is like his son in his charismatic ability to navigate his career path. Yet he’s as undervalued when we see him in 1960 by Ned and Lina as Pip will be by their children 35 years later. We need to piece it together, connecting Theo’s final exit with the story Pip has told about him in Act 1, to realize that he’s really the best person we see, more than worthy of the barely legible tribute that Ned has written to him in his journal. While Ned was reticent as a father after his disloyalty to his best friend, Theo was devoutly secretive with his wife and son, keeping hurts hidden that only Ned and Lina could have suspected. Speed does an excellent job of making the virtues of both Wexlers mesh together as a family trait. I found that Theo’s last walk into the wings, huddled in a trench coat on the last of Greenberg’s three days of rain, lingered long in my memory. And I find it ironic that, in the upshot of Walker’s life until we get our last glimpse of him, a father’s blessing has become a curse. No, the point isn’t just that we narrowly know our parents. That’s taking Greenberg’s drama rather obtusely, for Pip lost his father at the age of three! Time after time, these young people who are so familiar with each other prove to utterly misjudge one another. They know each other narrowly and, on top of that, know themselves narrowly in different ways. So eventually, Three Days of Rain and old King Lear actually intersect. Each time Ray Bradbury’s Fahrenheit 451 returns to Charlotte, it seems like a telltale barometer: how much closer have we come to fulfilling its grim dystopian vision – or how much further have we mercifully drifted away? Book burning and other assaults on culture may have been more virulent when the sci-fi classic was last served up at Children’s Theatre in 2005, when Taliban desecrations flamed our anger, or as recently as 2015, when ISIS insanity ruled Mosul and Palmyra. With Kindle and Google Books, the concern nowadays seems more centered on physical books and booksellers, for notwithstanding the proud illiteracy of the toxic Agent Orange 45 – who still knows words, mind you – reading and literature appear safe for now. The battlefront seems to have shifted to information, reporting, and science. In Charlotte, the culture wars played out at local theatres back in the 90s have been upstaged by anti-LGBT initiatives in the state legislature and racial profiling on the streets. Because of the complex crisscrossing of events in Charlotte and Charlottesville in the past few months, it gets pretty murky when we attempt to draw a sharp parallel between the firefighters that Bradbury’s hero, Guy Montag, breaks away from and the police of today. It was the protestors, after all, who carried the intimidating torches up in Virginia while police meekly looked on. Forget the Charlottesville hullabaloo, then, if you go to see the Bradbury combustion up at Spirit Square in a crackling Three Bone Theatre production, for the company surely programmed 451 at Duke Energy Theatre between the Charlotte and Charlottesville riots. Of course, while times inevitably have changed, productions will add another layer of difference, depending on the company and the director. Compared to the Children’s Theatre productions of 1993 and 2005, we get the full Bradbury stage adaptation now. Three Bone’s adds over 40 minutes, clocking in at 2:21, including intermission. The other big changes are the leading men that director Charles LaBorde has chosen. With Harry Jones Jr. as Montag facing off against Thom Tonetti as Chief Beatty, we have a clash of physical titans that we haven’t seen before, both firefighters looking more like hard-working enforcers. Greater contrasts are also drawn between youth and age, innocence and experience, ignorance and knowledge. Mark Sutton could do many things onstage as Montag, but looming before us as physically – or vocally – intimidating wasn’t one of them. His early ignorance looked comparatively slack-jawed or nebbishy, slightly endearing. Now we can see Montag as not only ignorant but also devolved and brutish. When Beatty warns that any influx of knowledge or enlightenment gained from reading will instantly register on Jones’s face, we believe it. He and the mass of mankind have evidently regressed so far that taking the first bite of the contents of a book is like beginning all over again – in a biblical or Darwinian sense. Tonetti can roar nearly as loudly as Jones, and if he certainly isn’t any more rugged as Beatty than Scott Helm was in 2005, he has the advantage of more years to make him seem more experienced, scruffier, more cynical, and more embittered. Helm’s version of the fire chief was cooler, more inscrutable, while Tonetti is a hot boiling mess. He is erudite, filled with forbidden knowledge, and like God in Eden, able to smell the onset of intellect. But ambivalence rages within Beatty, set in his commitment to firefighting yet never able to fully vanquish the notion that he has made the wrong choice. Written in 1953, Fahrenheit 451 isn’t prescient about women’s advances in the future, but Bradbury was writing about a dystopian America, so we’re likely to give him a pass. LaBorde plants some women among the firefighters, and Bradbury’s main women, though not in the workforce, are interesting and varied. Mildred Montag, Guy’s wife, is the most conventional, unquestioning in her devotion to pills and brainless TV pap. Lisa Hatt as Mildred is mindless and sedated enough to be a likely source of Guy’s smoldering discontent. Interestingly, there is a lax acceptance by Mildred and her neighbors of Montag’s predilection toward books. They’ll let it slide until Montag rocks the boat. Near the Montags, a neighbor lady is found to have a vast home library that must be incinerated. Angie Cee gets a fine cameo as Mrs. Hudson, the library lady willing to burn with her beloved books, playing her with a memorable wild-eyed zeal – and just a trace of motherly love. Her martyrdom certainly gives Montag the inescapable notion that there might be something in books worth dying for. Montag’s discontents at home and on the job make him vulnerable to the probing and teasing of his rebellious misfit neighbor, Clarisse. It’s a role that works well with the raffish delicacy that Stefani Cronley brings to it. Cronley becomes a dear and lively enough mentor to Montag for us to feel some of the same emptiness he feels when she disappears. Perhaps the finest character Bradbury created in Fahrenheit 451 was the crazed fugitive outlaw, Faber. Somebody needs to register the horror of what has happened in America, and somebody needs to have an inkling about what can still be done. Bill Reilly brings a wild unkempt fervor to Faber, a catlike cunning wrapped into his cowardice and a divine spark twinkling in his despair. Mankind’s survival hangs on a slender thread, and he’s it – unless Montag and others like him can work out as recruits. Like the Johann Stegmeir design concept for the 2005 Fahrenheit, Ryan Maloney’s set design and Ramsey Lyric’s costumes for Three Bone are not averse to the idea that we have entered a nuclear winter as well as an intellectual one. Other novelists have played with the idea that nuclear catastrophe might bring about reactionary rejection of science and culture. In Bradbury’s futureworld, nobody seems to know what exactly brought us to this, and that’s part of what makes it so sad. Most people, particularly the homeless and the poor, don’t need to be told that soup kitchens are all about feeding the hungry who are beaten down – temporarily or permanently – by the harsh realities of our teeming cities. But to an unexpected degree, Heidi Schreck’s Grand Concourse, set in one of these missions of mercy at a Bronx church, struck me as a play about soup. Not to worry, the current Three Bone Theatre production, at Spirit Square through Saturday, occasionally delves into the question of how to best serve the poor. Yet we aren’t out there among the hungry who are gratefully lapping up their free lunches. Instead, we’re behind the scenes – in the actual kitchen of the soup kitchen – so we’re mostly involved with the providers of the meals, not the recipients. Sister Shelley runs the kitchen, a nun who has chosen to discard the traditional costume and struggles to sustain another habit: prayer. Setting the kitchen timer on her microwave to one minute, she can’t nearly fill it with 60 seconds of earnest supplications. A new volunteer, Emma, enters in the next scene, and it’s really her time at the kitchen – first as a volunteer and then as a salaried worker – that shapes the arc of our story. About two-thirds through the action, which clocks in at 95 minutes, I had the feeling – can I admit it was a worry? – that we were watching one of those incubator stories about a flawed, wounded, immature young person who experiences growth and healing via the subtle balms of acceptance and friendship. We’ve seen a few of these, haven’t we? Lovely Emma turns out to be a different kind of apprentice, partly warm-hearted and enterprising but also partly toxic. The two men in this tragicomedy, Oscar and Frog, help in sharply defining the best and worst of Emma. Among her initiatives, the boldest is to expand the mission of the soup kitchen into helping the regulars get on their feet and find jobs. Appropriately, the first beneficiary of these attentions is Frog, who has long disregarded the taboos against camping out by the church and fraternizing with the kitchen folk. Her effect isn’t so benign in her various interactions with Oscar, the maintenance/muscle guy who regularly drops by for sandwiches kept in the fridge, usually lingering to lend the women a helping hand. Emma works on Oscar’s eyes with her good looks, then on his sympathies with her big lies. Everyone around Emma is hoodwinked as she spins plausible yarns to her mother, about her mother, and about herself. There is more complexity with Sister Shelley, who is dealing with her crisis in faith and the oncoming death of her dad. Unlike most volunteers, Emma returns for a second day, becoming a standout simply by persevering. Continuing to volunteer, Emma introduces new variations to the daily soup – a whole eggplant one day, maybe a few pinches of fennel the next. But she’s stirring the pot at a deeper level when she starts helping Frog to hop out of hopelessness. Why haven’t the sisters thought of doing that before? It starts Shelley to wondering. It also starts to make it obvious that Schreck isn’t primarily concerned about Emma’s apprenticeship. This playwright’s eyes are trained most diligently on how all the characters are affecting one another. What’s simmering up in the Bronx, workday after workday, is a human soup of interaction and influence – and this humble little soup kitchen is a microcosm for the Grand Concourse that is humanity. It’s a volatile stew without any pat or easy endings. It keeps on boiling along. There are plenty of energies distributed among this unpredictable foursome, and director Robin Tynes does a fine job in making sure we see how different – and how unevenly distributed – these energies are. Shawna Pledger hasn’t been this wired onstage since she made her first Charlotte splash in the title role of Sylvia four years ago at CP. Here she’s rechanneling that restless energy into Shelley, a neurotic and indecisive nun whose ultimate crucible will be forgiveness when young Emma pushes her to her limits. Pledger’s is an intense energy pent up in a pressure cooker of religious tolerance and discipline. Even when she stumbled on a line on opening night, it came out like part of Sister’s high-strung struggles. Emma’s confusions are on a more elemental, hormonal level than Shelley’s, and Callie Richards gives her a variety of erratic, moody, and sensitive shadings. Nothing about Richards’ demeanor suggests that Emma is a temptress. Nor are Jason Estrada’s costume designs spurring her in that direction. She’s sneaky, deceptive, and her conquest of Oscar is like a raccoon invading your attic in the middle of the night. Suddenly, she’s just there. Watching things unravel, we don’t know exactly how to analyze Emma’s ultimate violence. It’s passive-aggressive, to be sure, and its effect is irreversible, but Richards is careful not to give away how intentional it may have been. Life is often messy precisely because we encounter chaotic, messed-up people like Emma behaving irresponsibly. As portrayed by Nicholas Enrique Pardo, it’s easy to come away thinking of Oscar as a genial sacrificial lamb, pounced upon by both Emma and Frog. But his victimhood is more complex and unique than that, for he had trained to be a dentist in the Dominican Republic before the process of immigrating to the US effectively stripped him of his credentials. Now he holds down a day job to survive and attends a community college to improve his employment prospects. Pardo just struck me as too young to have all that mileage and dentistry in his rearview mirror – but I didn’t detect much in Schreck’s script that exposed this shortfall. Likewise, Bill Reilly may be a wee bit young to comfortably fit the aging hippy profile sketched for Frog, but he turns in such a compelling performance as this eccentric loose cannon that all incongruities quickly cease to matter. Reilly’s entrance at the dawning of his reclamation is delightful, largely because he himself seems shocked and disoriented by his new attire. The whole outing would have been even more extraordinary if Steven Levine’s fight choreography had been more meticulous. Notably more shabby – and less clinical – than the Playwrights Horizons’ off-Broadway production, Ryan Maloney’s set design jibes better with the way most out-of-towners think of the Bronx. This kitchen is more welcoming and, with Jackie and Peter Hohenstein’s prop designs, still richly detailed. The carefully crafted clutter and slovenliness of the kitchen also accords with the episodic manner that Schreck relies on in telling her story. Watching the jagged sequence of scenes unfold, it seemed that the playwright may have pieced them together like journal entries, maybe shuffling the order, discarding numerous scenes, and cutting out minor characters – the mother, the head nun, and a pesky teen delinquent – along the way. We sift through a cunningly calculated slovenliness to get at Schreck’s takeaway, with a few loose ends purposely left dangling. You won’t be as sure of what to make of Grand Concourse as the many tidier comedies and dramas you’ve seen before, but you’ll likely be more convinced of its authenticity. We all know that politics, connections, and strategic socializing often figure into securing Hollywood production budgets and achieving Hollywood stardom. We’re apt to think of the proverbial casting couch as Tinseltown’s exclusive domain. But can the same tools also work in the literary world, where writers aspire to lucrative publication and enduring prestige? You better believe it, playwright Theresa Rebeck tells us in Seminar, a surprisingly steamy — and sometimes dark — comedy that brings Three Bone Theatre to Spirit Square for the first time. The veneers of artistry, aesthetics, and collegiality rapidly disintegrate in successive encounters with a famed writer and his very exclusive fiction-writing class. Izzy, Douglas, Martin, and Kate all scrape together $5,000 apiece for the privilege of being praised, critiqued, berated, and mentored by Leonard in weekly sessions at Kate’s posh Upper West Side apartment. Kate has been honing her story about a narrator obsessed with Jane Austen for so long that cleverness and craft are all that remain. Izzy’s writing, on the other hand, is so laced with sensuousness and sexuality that it rouses mighty urges in every man in the room — and she knows exactly what she’s doing. Douglas arrives with a fine literary pedigree, key connections, and a manuscript that is already under consideration by The New Yorker. Martin has had the toughest time scraping up the necessary cash for tuition, so tough that he has been evicted from his apartment. He wouldn’t need to pay any rent if he could crash in one of Kate’s many extra bedrooms, but he’s oblivious to the possibility that Good Samaritan impulses might not be the primary reason why Kate says yes. There are more than a couple of things that Martin is oblivious to, and he’s very guarded about showing his writing to anyone, so he’s a useful person for Rebeck to have around for expositional purposes. So much must be explained to him until he becomes central to the story. Meanwhile, it’s Izzy and her serial seductions that stir the pot and drive the plot. There’s actually an admirable amount of balance in Rebeck’s script, but in the Broadway production directed by Sam Gold, the important character seemed to be movie star Alan Rickman as Leonard, while the students often seemed to be mundane minnows swimming in his orbit. Leonard is a revered writer who is still globetrotting on reporting assignments despite his literary decline, so Rickman’s aging celebrity was not amiss. And Rebeck delves so deeply into the mysteries of teaching and mentoring writers that our fluctuating assessment of Leonard’s efficacy emerges as more important than any other subject Seminar tackles. But Rickman’s aura, for better or worse, made Leonard appear above the politics, the exploitation, and the literary logrolling. With Michael Harris in the role (and probably in the best form of his life), the fault lines in Leonard’s character — and his redeeming humanity — are more readily evident. Three Bone director Steven Levine doesn’t have the luxury of imposing a huge gulf between Leonard and his students from a celebrity standpoint, so we also discover who Leonard’s costar is a bit earlier in the game. Rickman’s fame — and stage presence — really didn’t allow for an equal in the Broadway production. A subtler aspect of Rickman’s magisterial stature on Broadway was the stylish domain where Leonard held court. Ryan Maloney’s set design for Kate’s living room, flowing silk sheets for walls and simple furnishings, has an unmistakable elegance, not a word I’d apply to any of Three Bone’s previous efforts in NoDa over the past four years. But it’s Maloney’s evocation of a ratty artist’s apartment later in the action, complete with its telltale writer’s clutter, that had me flashing back to the Broadway production. Outside of ivied university walls and politically correct quads, taboos against student-teacher hookups obviously don’t apply, but with Three Bone’s comparatively leveled playing field, it’s easier to see that Izzy is playing the guys to her advantage — and actually less apparent that Leonard is playing her. Karina Caparino augments the difference by emphasizing Izzy’s wantonness and her frolicsome spirit. The Asian who played Izzy on Broadway was a little brainier, cosmopolitan. This Izzy is Bohemian with more raw and exposed emotions. That chimes well with Harris’s more vulnerable approach to Leonard. I found myself paying far closer attention to Leonard’s big monologue, where he addresses his past disgrace. For me, it was less of a rueful confession and more of a bitter outcry of victimhood this time around, accentuated by some deft lighting cues by designer Carley Walker. Unexpectedly, it’s the previously meek Martin who pushes the esteemed writer to open up. So yes, I can declare that Martin, in his painful — at times, infuriating — evolution demands a performance on a par with Leonard’s, and Scott A. Miller certainly delivers. I’m sure it isn’t a coincidence that Levine elicits an outing from Miller that’s as extraordinary as what we see from Harris, arguably eclipsing Miller’s stellar work earlier this year at Children’s Theatre of Charlotte in the title role of Danny, King of the Basement. I’m only wondering how Levine did it. It’s easy to suppose that Levine enabled Miller and Harris to look inside themselves and find things they had never discovered before. That’s a typical mythology applied to directors. But here I suspect that Levine opened up new depths in Rebeck’s text, for I must admit that I thought it was a far slicker piece when I left John Golden Theatre in 2012 than I did at last Thursday night’s opening. Beth Killion’s costume designs for Douglas aren’t as loud as those I saw on Broadway, making the well-connected student less of an object of derision. I found that new twist as enjoyable as the others, but with three of Charlotte’s best actors bringing their A games to this local premiere, Paul Gibson’s shortcomings as Douglas were more glaring than they might be otherwise. To mesh better with this ace cast, Gibson’s cue pickup needs to be swifter and his delivery surer. When he settled down — conquered his opening night jitters? — Gibson offered us a nuanced rendering of Douglas’s sense of entitlement and his nonchalant insider’s knowledge, not cartoonish at all. But his difficulties had come when he needed to dominate. Our hostess Kate has more complexities than Izzy, and she can be even more irritating than Martin with her stubbornness and preciousness. Becca Worthington is better at Kate’s priggishness than she is at projecting the embarrassment of her privileged wealth, but there are hidden dimensions to this Kerouac hater that go undetected by Martin until the scene changes — and Worthington is marvelously attuned to those devastating surprises.